Nalboor Maintenance Are You Using the Right Cleaner for Your Marble? Are You Using the Right Cleaner for Your Marble? Marble and granite are beautiful and luxurious materials that can take any kitchen to the next level, but they do require a little special treatment. You cannot clean these materials with just any ordinary product because you might inadvertently damage the finish. To prevent etching and staining, ensure that you’re using the right materials on your luxurious natural stone surfaces. You may have to spend a little more to invest in the special cleaners, but you’ll make the job easier and faster while also protecting your investment in travertine, marble, or granite. Known as etching, the dull finish that occurs after using a disinfectant on marble is permanent. This occurs as the result of using a product that’s too acidic or alkaline in nature. This includes any cleaner that’s made to kill germs, basic vinegar, ammonia and bleach. The shiny surface will be destroyed on the top level of stone, and correcting it requires using a special material to restore the shine and high-polish finish. If the damage is serious enough, you’ll have to have it corrected professionally by having the damaged areas sanded away and the marble polished all over again. While it’s rare to cause damage this severe, it’s still better to avoid the problem from the beginning by investing in the right cleaning materials. The challenge with marble is that it’s made of calcium carbonate, and that will react with anything that has a high acidic or alkaline content. Not only will household cleaners that are designed to destroy germs cause damage, but a glass of spilled juice can also leave unattractive marks on your marble. This includes drinks like coffee, wine and juice, and even some foods that are very acidic can damage the finish. This is why it’s important to clean up spills promptly, and you may want to prepare acidic food on a cutting board or plate to further protect your expensive countertops. If you’re in a pinch for a cleaning product, reach for the same detergent you use on your dishes. Most dish detergents, such as Dawn, are pH neutral and safe for use on your fine marble. All you have to do is dilute them in some warm water and then wipe down the counters or floors using a soft rag or sponge. Another option is to simply use some warm, distilled water to keep your marble looking sharp and ready for company. If something is accidentally spilled on the surface, wipe it up with a damp rag right away to ensure that all of the residual acid or sugar is removed from the marble surface. However, when you keep your kitchen stocked with the right cleaning supplies, then you’ll never be left searching for an appropriate cleaner at the last minute. This cleaner is easy and safe to use, and it can be used every day without fear of damaging your beautiful counters, floors, window sills and other marble areas. There’s no odor to make you sneeze, and it can be used indoors and on your exterior living areas. It’s strong enough to tackle even difficult stains, and a little goes a surprisingly long way. You can avoid some cleaning challenges by giving your marble the protecting coating it needs. Any time you have a natural stone with a porous finish, you should have the surface sealed about once a year. Depending on your use, you may need to invest in this process more frequently. While professional companies are happy to come perform this service for you, it’s really not necessary. 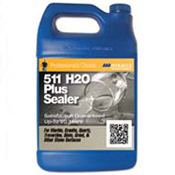 We offer a few different high-quality sealers that are appropriate for marble, concrete, granite, limestone and other materials. The sealer penetrates into the stone to develop an invisible shield against all types of stains. It won’t alter the natural look or dull the finish in any way, but you won’t have to worry as much about juice damaging the finish or storms leaving your outdoor tiles looking dull and stained. Our products are safe enough for use in food areas, yet they’re durable enough to perform in exterior as well as interior applications. In addition to having the marble sealed, you can also enhance the shine by using a specially formulated product that brings out the color while better protecting the surface. Our seal and enhance products are appropriate for use on tumbled, hones, sandblasted, acid-washes, textured and polished surfaces. It’s made for marble and other natural stones, and it’s designed to give the surface a higher level of protection. As with our other products, it can be used indoors and outdoors to make your natural stone surfaces look incredible. You’ll avoid damage right now and save money in the long run by keeping your marble looking like new. When you make the investment in natural stone finishes for your home, take it a step further by also getting the right cleaning products. Your new stone surfaces are an investment in your property, and you should take care to protect them and keep them looking amazing. While you may find some appropriate cleaners in your local stores, we offer specially formulated options that are completely safe and affordable. They come in sizes ranging from a small pint for household use to a full pail that’s appropriate for contractors. If you aren’t sure which product is right for your situation, then call our friendly staff to learn more about the Nalboor line of cleaning products and place an order. We’ll answer any questions you have and help you choose the right products for your needs.